The what isn’t new: That auto shows, as we have come to know them, are dying. The who, however, is: Mercedes-Benz is the latest automaker that might elect not to show up at next year’s Detroit Auto Show. The truth of the matter is that the ROI for automakers at these shows just isn’t what it used to be. Journalists don’t really even need to physically be at the auto show to obtain press materials anymore. Most sites have all the releases pre-written already and publish them as soon as embargoes drop. Glossy press photos and stats pulled from press releases are all accessed online without anyone having to leave their desk. Plus, with the mass of news going up nearly nonstop during auto shows, it’s easy for announcements to get buried in with everyone else’s. Obviously, automakers don’t want that; they want the maximum amount of coverage and attention for their marketing dollars spent. Mercedes’ withdrawal from the Detroit Show would leave a sizable hole on the show floor. It’s always had a large and visible booth. But, it would join automakers like Mazda, Volvo, Porsche, Jaguar and Land Rover, which have also chosen to skip the show. 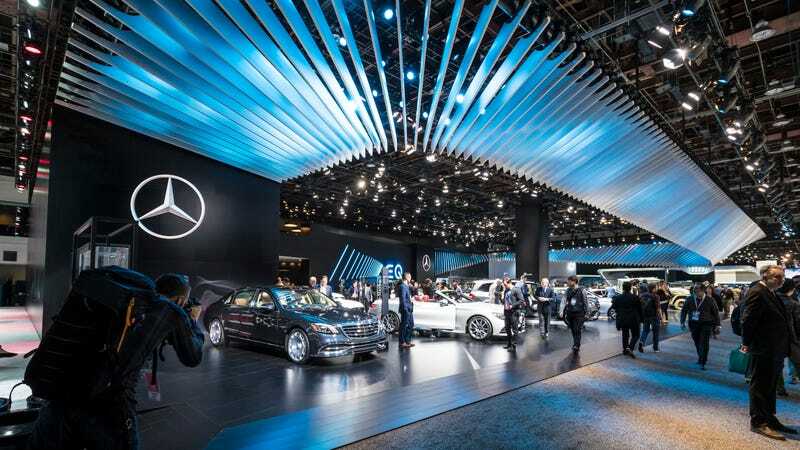 It’s unclear how much money an automaker will typically spend on a booth at an auto show and how much the subsequent coverage translates into actual vehicle sales, but it doesn’t seem to be profitable if fewer and fewer are turning up at the shows. It would almost make more sense just to use that budget on a standalone event, where noncompetitive coverage is nearly guaranteed. Personally, this makes me sad. Going to an auto show on public days is great! For consumers, it’s a wonderful way to check out a car, sit in it and see how it feels without being bothered by a pushy or rude salesperson. You can spend as much time with a car as you’d like. Plus, the cars are all in one place, which makes back-to-back comparisons very convenient. We have reached out to Mercedes for comment on the matter and will update if we hear back.